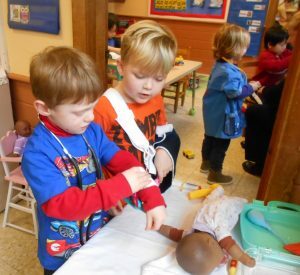 What’s a St. Paul’s Weekday Nursery School day like? Every school day is balanced with both free play time and structured group time. Children have many opportunities for independent decisions, time for listening, and practice following directions throughout the day. 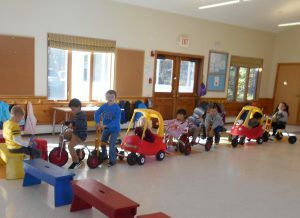 Our free play time offer opportunities and choices involving visual arts (paint, crayons, markers and other crafts), puzzles, blocks, dramatic and pretend play (some examples being dress up, play kitchen, and manipulatives), sensory table activities, and gross motor activities including tricycle riding and the use of our large gross motor room. Music is scheduled into the day both formally in a class- time and more informally in the form of finger plays and songs. Classroom time focuses on projects and activities in small groups. These activities encourage fine motor skills, social and behavioral skills, and following directions. Weather permitting, our days end outside on the school’s playground. On inclement days, our large gross motor space is used once again at the conclusion of the day. We typically follow the same schedule, but allow flexibility for special events. Special events might include dance classes, puppet shows, visits from petting zoos, first responders, etc. Lunch and Extended Day options are available. Error: Error validating access token: Session has expired on Thursday, 16-Aug-18 19:01:59 PDT. The current time is Tuesday, 23-Apr-19 06:03:25 PDT.